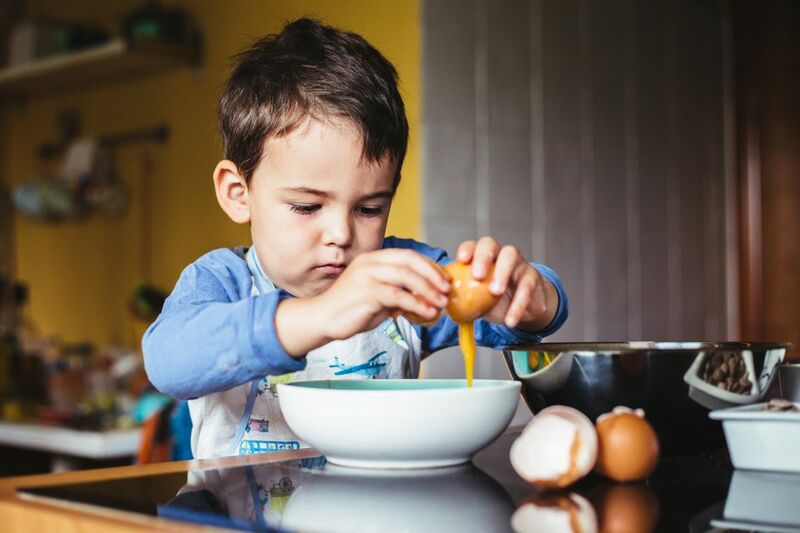 "All the basic tools that kids will appreciate as they start to explore cooking and baking...includes an apron and chef’s hat, two oven mitts." "A variety of breakfast, lunch, and dinner recipes that keep kid cuisine in mind and feature easy, accessible ingredients." "Made by a well-known foundry in France and has all the makings of a high-quality kitchen tool...and features such as finger guard and finger rings." "Included in the set are small versions of dishwasher safe basic kitchen implements...a silicone loaf pan and six silicone baking cups." "Gives your child a boost so they can work at your height, adjustable, available in seven different colors." "Order the apron in a range of sizes designed to fit everyone from a 1-year old to a 13+-year old." "With adult supervision, your child will be delighted to make these super cute (and fun to eat!) Mickey Mouse waffles." If you want to get a little chef on the road to culinary greatness, the Curious Chef’s 27 Piece Foundation Kit is a great place to start. This kit is full of all the basic tools that kids will appreciate as they start to explore cooking and baking. The set includes such basic utensils such as a whisk, spatula, measuring cups and spoons and a rolling pin. It also includes a mixing bowl, kitchen timer and cookie cutters for your baker-in-training. To help kids look the part, the kit includes an apron and chef’s hat, plus two oven mitts. The apron is adjustable, so it fits children across a wide range of ages. Especially young or petite children may need more adjustments made to the apron — but it offers plenty of room to grow! The utensils earn high marks for their durability and quality construction. If you want to give a young chef or aspiring baker a kit that will help them feel right at the home in the kitchen, the Curious Chef’s 27 Piece Foundation Kit is the best overall gift to give. A cookbook with kid-friendly recipes and eye-catching graphics will help young chefs to learn basic skills and have fun in the kitchen. A popular kid’s cookbook is Cooking Class: 57 Recipes Kids Will Love to Cook (and Eat!). This book will help your child to think outside the box with recipes designed just for them. Parents especially love that the book includes a basics section that teaches essential kitchen skills, as well as tips on cleaning up and setting the table. There are a variety of breakfast, lunch, and dinner recipes that keep kid cuisine in mind and feature easy, accessible ingredients. There are lots of pictures and graphics to make the process understandable and appealing. Plus, the book even includes stickers that serve as ingredient labels for homemade dressing. This cooking book for children makes a great gift and will quickly become a go-to resource! Want to take a look at some other options? See our guide to the best cookbooks to buy kids. At some point, younger chefs will graduate to the point of wanting to cut, chop, and dice tougher fruits and veggies or meats. Our favorite kid-friendly knife set is the Opinel Le Petite 3 Piece Chef’s Knife Set. This knife set is made by a well-known foundry in France and has all the makings of a high-quality kitchen tool. Most importantly for young choppers, the set includes a finger guard to protect fingers from the blade during meal prep. Additionally, the knife and vegetable peeler have finger rings that encourage proper hand placement — minimizing the opportunity for slipped fingers or incorrect grip that could lead to an accident. The 4-inch stainless steel blade of the chef’s knife features a rounded tip as an added safety feature. It should be noted that this set has sharp, high-quality cutting implements. The manufacturer recommends that these tools be used under adult supervision. Parents that love to cook along with their children will find that these knives are the perfect step-up for children that have developed basic kitchen skills and are looking to advance their meal prep abilities. These tools will last a long time and will make any junior chef feel like a professional as they slice, dice, and chop their way through a variety of foods. For a child that loves the idea of baking up delicious cupcakes, cookies, and more, the Handstand Kitchen Intro to Baking Set is a great gift. This 17-piece set includes a variety of tools that will make it easy to create baked goods that look and taste great. Included in the set are the basic kitchen implements, such as a rolling pin and spatula. The kit also includes a silicone loaf pan and 6 silicone baking cups — perfect for easily releasing golden brown loafs and piping hot domed cupcakes. The utensils are dishwasher safe, making clean-up easy. The silicone baking pan and cups earn a lot of praise for their non-stick properties. One thing that parents love is the small size of the utensils, especially the rolling pin. However, a few people felt that the included recipe cards were too elaborate for a child to follow and involved tools not included in the set. Still, this baking kit is easy to use and easy to clean — making it a great choice for getting a child started baking cupcakes, cookies, breads and more. Part of the challenge of letting kids help cook in the kitchen is helping them work at a countertop height. Having them sit doesn't work and letting them stand on a stool or chair can be quite dangerous. This learning tower helps give them a boost so they can work at your height which will relieve your back and make them feel like they are really helping out. Available in seven different colors this tower can adjust to whatever your child's height may be. Whether they are a curious toddler who wants to get in on the action or kindergartner wants to help roll out pizza dough for pizza night, this a gift the whole family will enjoy. Reviewers go nuts for this product with many saying this has stopped their two-year-old from clinging to their leg when they cook since now they can see what is going on. For an apron that will fit petite chefs and growing cooks alike, the apron and chef’s hat set from Obvious Chef is our top choice. While there are many children’s aprons available, most are one-size-fits-all with limited adjustability. The Obvious Chef’s apron and hat set is different. Order the apron in a range of sizes designed to fit everyone from a 1-year old to a 13+-year old. The apron also comes in a multitude of colors, making it easy to find a color that will stand out in the kitchen. It does seem that the apron sizes run on the small side, and there isn’t an exact size guide available. So it may be best to order the next size up if your child is in between sizes. The chef’s hat features a Velcro closure to help it fit a variety of head sizes. In general, people find these aprons to have vibrant colors and quality construction. They also are affordably priced and packaged well. Dress your little chef in this apron and hat combo and they’ll feel right at home in the kitchen! Make cooking breakfast even more fun for children with the Disney Mickey Mini Waffle Maker. While not specifically designed for use by children, this waffle maker is easy to use. With adult supervision, your child will be delighted to make these super cute (and fun to eat!) Mickey Mouse waffles. Simply pour in the pancake batter, wait a few short minutes, then pop out the freshly-baked waffles and enjoy. The waffle maker has non-stick baking plates that easily release piping hot mouse waffles. It also features rubber non-skid feet and an illuminated power light that alerts you when the unit is on and ready to go. Bear in mind that this unit can only make one waffle at a time, so a little patience may be needed if your child is cooking up waffles for a crowd. Overall, though, users are impressed by the crisp, evenly-cooked waffles made by this waffle maker. Give your child a little more incentive to make breakfast with this cute and easy-to-use Disney Mickey Mini Waffle Maker.